This is my quintessential I'm welcoming summer with open arms skillet berry cobbler. It goes perfectly with my sunny-with-a-high-of-seventy-five mantra, and it involves melting a whole stick of butter, and the freshest, juiciest berries around. You really can't go wrong. It's quick, easy, and top this baby, warm out of the oven, with some vanilla bean ice cream and you have got your flawless summer go-to dessert. Also known as the most perfect breakfast, lunch, and/or dinner you could ask for. If you're into that sort of thing. I also added some blackberries to mine cause why the heck not. 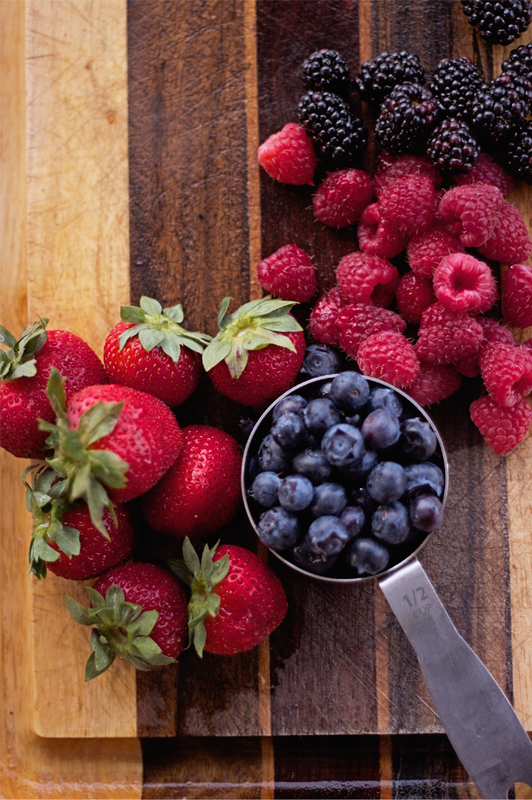 You can use any berries you fancy. 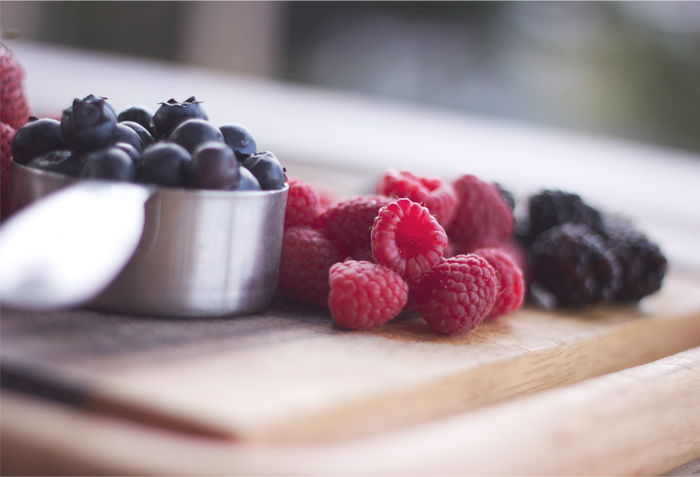 Mix 3 tablespoons sugar, 1/2 cup blueberries, 1/2 cup raspberries and 1/4 cup water together in a saucepan. You're gonna cook these about 10-12 minutes over medium high heat. The berries will burst, you will smell that glorious smell, and the mixture will begin to thicken. Transfer these to a bowl to let cool slightly. Whisk together your flour, sugar, baking powder, and cinnamon in a separate bowl. You can add a dash of salt if you like. Sometimes I do, sometimes I don't. Set aside. Plop your stick of butter into your cast iron skillet and let it melt over medium-high heat. Once melted, remove the skillet from the heat. Add your cup of milk into your dry ingredients and mix until your batter is a thin liquid. A taste test right about now would be a good choice. Pour your batter into the skillet over the melted butter. I KNOW. Gently mix together your cooked fruit with your remaining uncooked fruit and lemon zest and then pour this on top of your batter. Whatever you do, do not stir this- just let it fall. 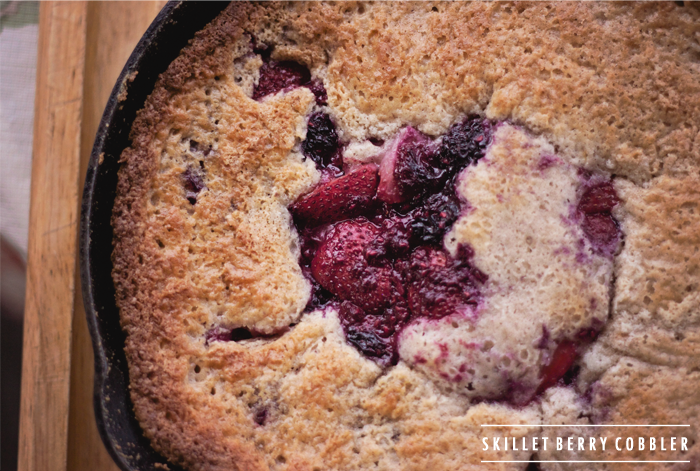 Remember: Imperfect is actually perfect when it comes to the best skillet berry cobbler you'll ever eat. Bake at 350 degrees for 35-40 minutes. Serve hot with that vanilla bean ice cream I told you about earlier. Happy summer-skillet-cobbler-making! i love you for a lot of reasons but also because this is egg free and i can make this for our whole family including our egg allergy boy. xoxo!! That berry cobler is something really incredible. I think that if you could pay for assignment you would get some really great secrets on how to do it better. I like your post! Literally, I fell in love with your pics. I hope you will write more posts. I decided to type my essay on this topic. I hope it will be very interesting and useful. Thank you for this post. That's all I are able to say. You most absolutely have built this blog website into something special. You clearly know what you are working on, you've insured so many corners. Thank you for this recipe. I love cooking and I used to cook this kind of special dishes in my home. The pictures you were posted here really tempting me. By best essay writing service. The blog is good. The article takes a look at the Skillet Berry Cobbler. 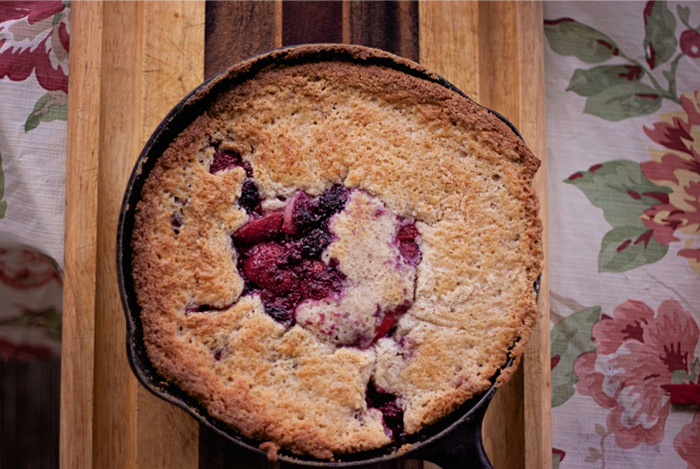 Do you know how to prepare Skillet Berry Cobbler? If you go through the article, you can get the Ingredients of Skillet Berry Cobbler. You can also find tips on how to make Skillet Berry Cobbler. The images added in the article are attractive and can increase your attention to go through the article. Wow... such a nice recipe you are shared here. After reading your recipe I think to make this dish. But I have no these ingredients for making this. Next time to write any simple recipe for preparation.cloud vps server hosting waiting for your updates. After reading this article I can't wait my hungry. I think everyone likes your recipe. So upload new recipes and manage faster. After cooking I think you want my help because our company is cleaning companies Brisbane. if you want any cleaning services contacts. And enjoy your new recipes.